You have probably figured out that I am a big fan of local produce and sustainable agriculture, and therefore, probably are not surprised to know I get the majority of my food from my garden, our local farmer's markets, a CSA and a CSA program called Philadelphia Winter Harvest. Last week I heard through my friend Susan Gibbs that Pete's Greens, an organic farm in Vermont suffered a massive barn fire in which there was about $250,000.00 of damage, The farm has an active CSA program including not only fresh organic vegetables, but also free-range beef and pork and pastured chicken. As most farms are, it was under insured. Though Pete's farm is not a CSA I would participate in I want to help in support of the CSA movement as a whole. Susan Gibbs at Juniper Moon Fiber farm with her wealth of readers, is hosting a massive fund-raising event to help cover part of the re-building costs. In basically a huge giveaway, many artisans large and small have donated items ranging from a set of hand-made soaps, to autographed books, hand-spun yarn even a full share in Susie’s farm. To donate, or to read more about the project head on over to her blog at Juniper Moon Fiber Farm. 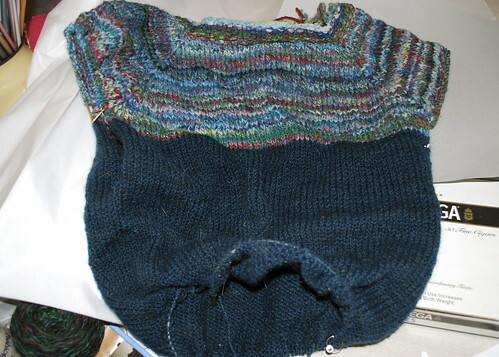 I have donated a hand-knit sweater which I SWEAR will be done by the time the prizes are announced! 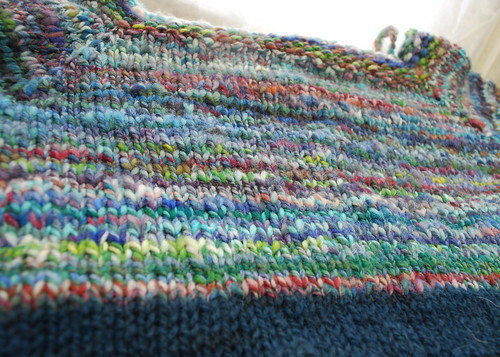 The top is my hand-spun yarn, a correidale wool, the body is cormo/mohair blend from Juniper Moon. The chest measures about 40 inches around, and it is almost of done! Really! It's going to be beautiful, Lisa! So wonderful of you to toss it in as a prize. It would be hard for me to give away a WHOLE SWEATER! ;-) Because it would take me three years to knit it! But the fire was heartbreaking, and it's much easier to sacrifice a little for those who have lost so much.